Blog / Events / UCI Road World Championships are coming to Tuscany! 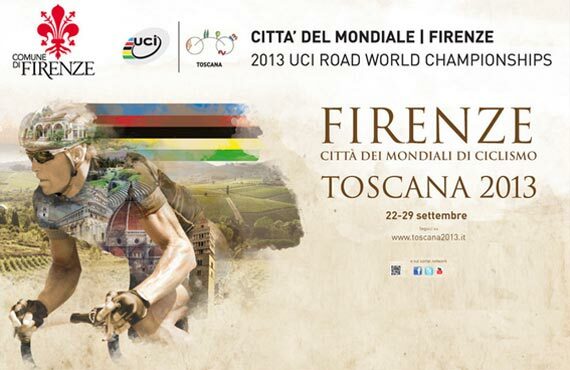 Florence and Tuscany is preparing for the upcoming UCI Road World Championships 2013 which will take place between September 22 and 29. It is a great occasion to visit various locations in Tuscany and enjoy the exhilarating experience of seeing the cyclist racers speeding by! And if you’re already going to be in Florence and Tuscany that week, now you will know what is going on as you see streets cordoned off for the racers to pass on by! The week-long championships actually starts off on Saturday, September 21st as the teams hold their time trial trainings across the various cities. Florence, for instance, will have the trials passing across all of the downtown area in the morning, with an end of the trials foreseen by lunch time. If you’re in Florence, prepare to do some sightseeing as well as just stand by the race route and cheer! Of course, this won’t be the only time the race route passes through the historical center (the route passes right by the Duomo! ), so keep an eye out every day. The first official event kicks off on Sunday, September 22 with team time trials starting in Pistoia and ending in Florence, at the Mandela Forum. Monday through Wednesday will be days on individual time trials between Montecatini Terme, Pistoia and Florence. Road race trials will be held on Thursday and the road races will then take place Friday, Saturday and Sunday, from the 27th through the 29th. In Florence, the trials cross the historical center in the morning. All of the races include the final portion in Florence. Starting from the time trials taking place on September 21, the historical center is part of the race route on most days, although not for all of the races taking place. The area around the stadium will be the most impacted by the races, as the Mandela Forum is the site of the finish line every day. The area between the stadium and Viale dei Mille up Via Bolognese, Via San Domenico up to Fiesole and the area behind the town of Fiesole down to Pian di Mugnone will also be involved throughout the week. What this mean in practical terms is that many streets will be closed off for both parking and driving, both in Tuscany and in Florence. The city of Florence has set up an entire section on its website dedicated to information on the championships and how it impacts mobility in the city for both residents and visitors alike. The page has information on parking areas that will be available and what will be closed off and, most importantly, when. Even if it’s only in Italian, scroll down halfway down the page to “Mappe dei percorsi di gara giorno per giorno” to check out the .pdfs for the days you are interested in. If you need to drive around the city, there are maps showing alternative routes to take to avoid the race routes and being stuck on a closed street. Please make note that there are two races almost every day (then 3 and 4 the last weekend) during the week: the routes are NOT open in between the races, you have to wait for the second or other races to be over for the streets to reopen to normal traffic. Want to see the finals? Grandstands are being set up at the finish line at the Mandela Forum so you can buy tickets to see the end of the races, whatever day you might be here! Information on costs and passes here, with links to the online sites where you can buy tickets. No matter the inconveniences the Cycling Championships might bring to a city like Florence during the entire week, we are excited to have such an important event happening right outside our door and look forward to heading out to see parts of the races!! It’s time for the Rificolona!